The total chemical synthesis of proteins has been one of the most challenging topics of organic chemistry in 20th century. The discovery of solid phase peptide synthesis (SPPS) in 1963 by R.B. Merrifield and the development of native chemical ligation (NCL) in 1994 by Kent and coworkers enabled the synthesis of large proteins. 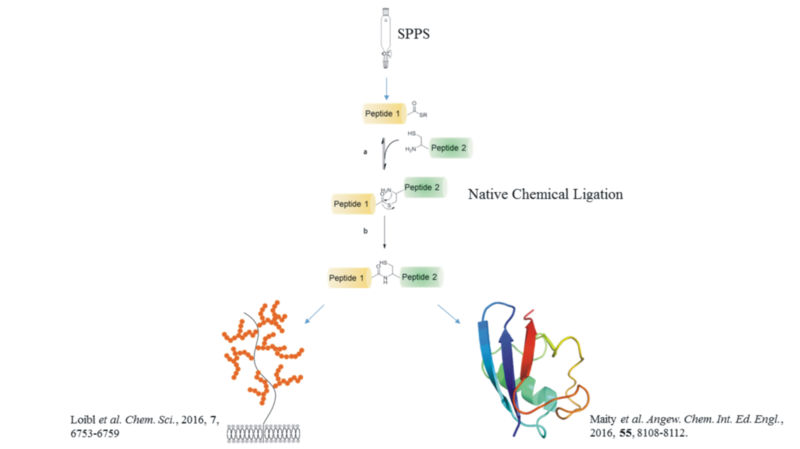 Moreover, NCL expanded the scope of total chemical protein synthesis immensely by allowing site-specific introduction of native and artificial modifications. Researchers continuously try to refine the conditions for NCL. Thus, I will report on two recent publications with respect to their application in NCL and chemical protein synthesis.